Ambient mode is great, it keeps the screen always on. No need to twist your arm to see time. Especially if you have a watch with (transflective) display that doesn’t need backlight (Sony Smartwatch 3, Moto 360 Sport, Casio WSD-F10). What can be even better? Add the last notification to that. 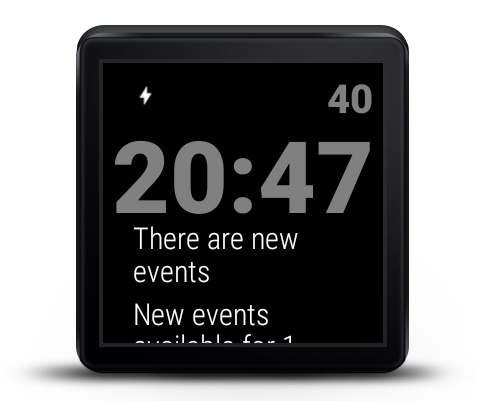 So then you can see both time and your last notification on display (without backlight and without the need to move arm). Yep, these are the Notification Changes in Android Wear 2.0, also see comments on /r/androidwear (Reddit). There goes the great usability of my Everyday digital watch face. Complications for (Android Wear and Apple Watch) are good in general. However in this particular use case it means that instead of two lines/methods that allowed the use of ambient peek mode, it will require way more code in two different apps. Observing notifications on phone and providing them to complication: The issue here is that the last notification may not match the actual last notification on watch (as there may be local only notifications). Another issue is that already configured notification blacklist that is managed by Android Wear and this app will need to duplicate that (with user configuring both lists).